In this special episode of The Great Work Radio we speak with the Marquis Vanni Torrigiani Malaspina, descendent of a long line of Florentine Italian noblemen who is one of the primary custodians of the beautiful Torrigiani Gardens in Florence. The Giardino Torrigiani is the largest privately held urban estate in Europe. Vanni takes us on the garden's Path of Enlightenment, gives us a thorough history of his aristocratic family, and explains the esoteric significance of the estate's plethora of arcane iconography - including the awe-inspiring Torrigiani Tower of Athanor - a colossal 19th century alchemical oven in which bodies were burned as purification. Be sure to watch the associated video, shown below, which goes even further to illustrate the beautiful Temple of Arcadia, the ethereal Path of Enlightenment, as well as the astounding history and function of Torrigiani Garden's Baccani Tower - otherwise known as The Tower of Athanor. 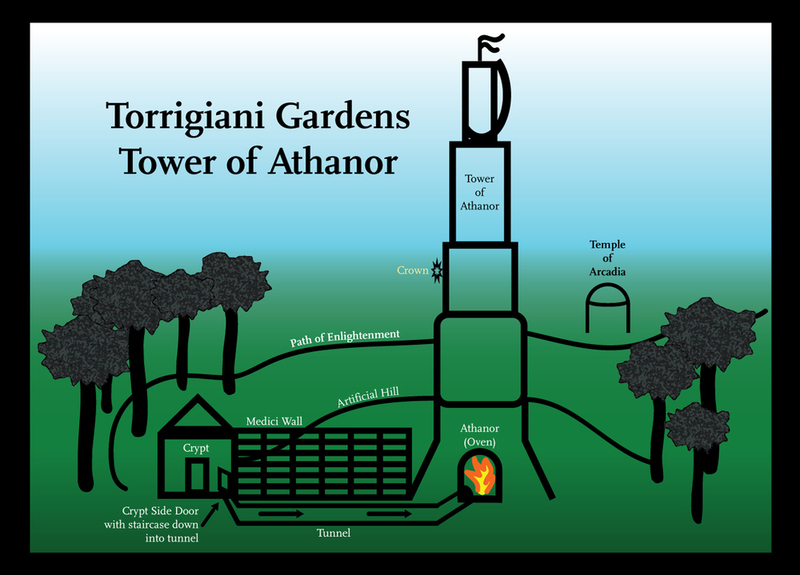 "THE TORRIGIANI TOWER OF ATHANOR"
Personaggi molto famosi hanno vissuto oppure hanno lavorato nel giardino torrigiani o ad esso si sono ispirati. Agli inizi dell'ottocento famosi scrittori inglesi infatti passeggiavano nel giardino torrigiani affascinati dalla sua bellezza e fonte per loro di grande ispirazione. Henry James si ispirò guardando la Torre di notte per il libro "giro di vite"; Elizabeth B. Browning era innamorata delle rose del giardino e Hawthrone rimaneva estasiato dagli intensi profumi della grandeOlea fragrans. Ancor prima, nel 1716, il famoso botanico italiano Pier Antonio Micheli, vi fondò la prima società botanica italiana. Nel 1951 invece il Marchese Giorgini, che abitava nel giardino, organizzò nei saloni del piano nobile della villa Torrigiani la prima sfilata di alta moda italiana. Grandi feste poi venivano organizzate nel giardino Torrigiani fin dal Cinquecento e poi nell'Ottocento, come ad esempio nell'occasione dell'arrivo con la mongolfiera dei fratelli Godard da Parigi a Firenze, con atterraggio direttamente nel giardino. Very famous people have lived or worked in the garden torrigiani or have been inspired. In the early nineteenth century famous English writers in fact walked in the garden torrigiani fascinated by its beauty and a source of great inspiration for them. Henry James was inspired by watching tower at night for the book "crackdown" Elizabeth B. Browning was in love with the rose garden and Hawthrone remained entranced by the intense scents of grandeOlea fragrance. Even earlier, in 1716, the famous Italian botanist Pier Antonio Micheli, founded the first Italian Botanical Society. In 1951, however, the Marquis Giorgini, who lived in the garden, organized in the halls of the main floor of the villa Torrigiani the first Italian high fashion. Great feasts were then organized in the garden Torrigiani since the sixteenth century and later in the nineteenth century, such as the occasion with the arrival of the brothers Godard balloon from Paris to Florence, with landing directly in the garden. Was human sacrifice a part of the alchemical ritual enacted in the oven of this beautiful Tower of Athanor? Is this the Bohemian Grove of Italy? One clue mentioned in the documentary is that there used to be a large statue of an owl next to the crypt. Could this be the same as the colossal Moloch Owl at the Bohemian Grove in Northern California? The Cremation of Care ceremony at the Bohemian Grove - as it was announced by Alex Jones and Jon Ronson back in 2000 - in which "Dull Care" is personified and sacrificed, has caused much controversy. Human sacrifice - more specifically child sacrifice - as well as animal sacrifice - do seem to be at the crux of certain extreme religious rites. On a visit to Jerusalem last year, I was astounded when the tour guide announced that we were passing the hill known as Gethsemane where children were ritualistically sacrificed to Moloch. What is the purpose of human sacrifice? Is it alchemical? Does it please someone's god? I believe that human sacrifice serves as the ultimate cremation of care. I believe that those committing this most heinous of atrocities tear a hole in "reality" and temporarily wake up from the dream that is life. I believe that through the enforced transmutation of other human beings - especially innocent beings still deep in the dream of life such as children and animals - the elite sacrificers of the world achieve a lucidity they are convinced is otherwise impossible, and that this is why they are willing to go to the extreme lengths and take the excessive risk that is required in the acquisition and execution of this of form ritualized murder. It is also said that the Elixir of Life is the essence of the human soul, and that sacrificers are able to condense and imbibe the essence of their victim at the time of bodily transmutation and purification. In the most excellent movie by Jim Hensen and Frank Oz - The Dark Crystal - arguably their masterpiece - they show evil Skeksis distilling the soul essence of their plebeian underlings into a juice that they drink to keep their decrepit old bodies from dying. This is likely a rather obvious analogy referring to the actual activities engaged in by certain individuals and groups which consider themselves elite. It is entirely possible that Hensen and Oz were exposed at some point the the inner workings of the so-called Illuminati. On a side note: the word Illuminati is an Italian word which simply means enlightened. By that definition, all enlightened people - i.e. any modern person - can be Illuminati. And it's not exclusive to Western societies. Perhaps the most extreme example in the world's historical records is the mass human sacrifice which took place in Pre-Columbian lands of the Inca, as well as in Mesoamerica with the Aztecs and their predecessors at places like Teotihuacan. Indeed one of the most important stories in the Old Testament is that of Abraham readying himself to sacrifice his son. Passover is the celebration of the saving of Jews from the mass human sacrifice of all of the first-born sons in pharaonic Egypt. The reason I created this documentary and radio program is because I believe it is time we address the topic of human sacrifice out in the open. Religion can no longer induce obeisance by the various strata of societies to scriptural prohibition of antisocial behavior. Gone are the days when the masses would adhere to biblical mandates. Muslims still follow the Koran, but that is rapidly eroding because of the internet. Even Hasidic Jews held a 40,000 man forum in New York City last year to address the topic of internet corruption of themselves and their families and communities. Is there an alternative to the apparently life-enhancing benefits of committing the greatest crime imaginable that is human sacrifice? I believe there is: it is to Know Thyself. You do not need anything that you do not have. You already have Revelation within you!